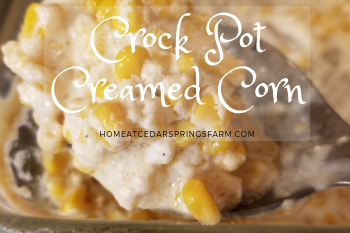 Crock Pot Creamed Corn is a simple side dish for any night of the week or special occasion when you need to feed a crowd. Whole kernel corn, cream cheese, butter, heavy cream, sugar, salt, and pepper tossed in a crockpot and turned on. In a few hours, your corn is steaming hot and ready to eat. This creamed corn is rich and creamy with just a touch of sweetness and makes a perfect side dish. It’s a super simple recipe with just 6 ingredients. It only takes minutes to throw everything together, and the crockpot does the work for you. This makes the creamiest creamed corn you have ever eaten. The cream cheese, butter, heavy cream, and sugar come together to make the most delicious cream for this corn. You could serve this as a side dish for just about anything. I would serve this as a side to a sandwich or even with a steak. Serve this to your family as a weeknight dish, take to a potluck dinner or a cookout with neighbors. Creamed Corn is a dish that goes well with just about everything. You have never tasted anything like this before. It has an entirely different taste than the canned creamed corn. Once you make this Crock Pot Creamed Corn, you may never go back to the canned creamed corn again. Try it tonight; it will not disappoint your taste buds! This Southern Cornbread Salad is another delicious side dish and will also feed a crowd. Some of the links on this page are affiliate links. 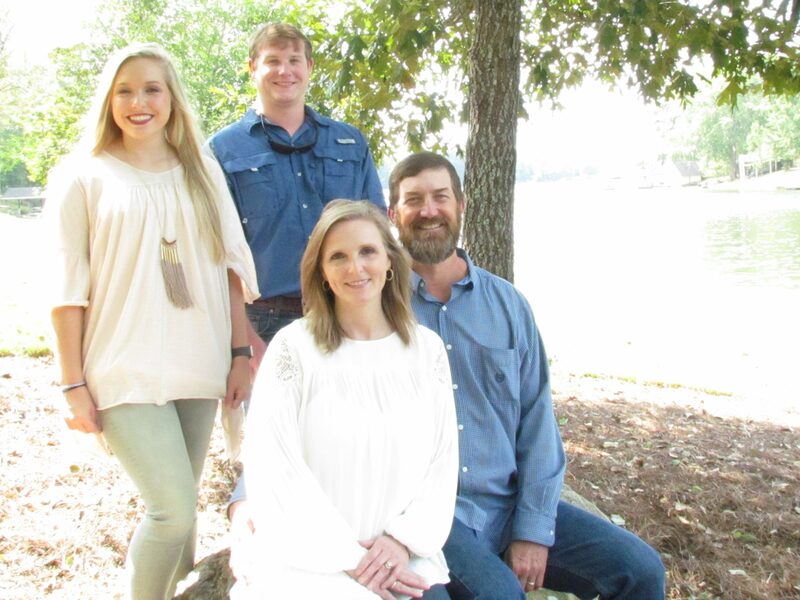 Home at Cedar Springs Farm may earn a small commission for purchases made after clicking links on this page. Learn More. 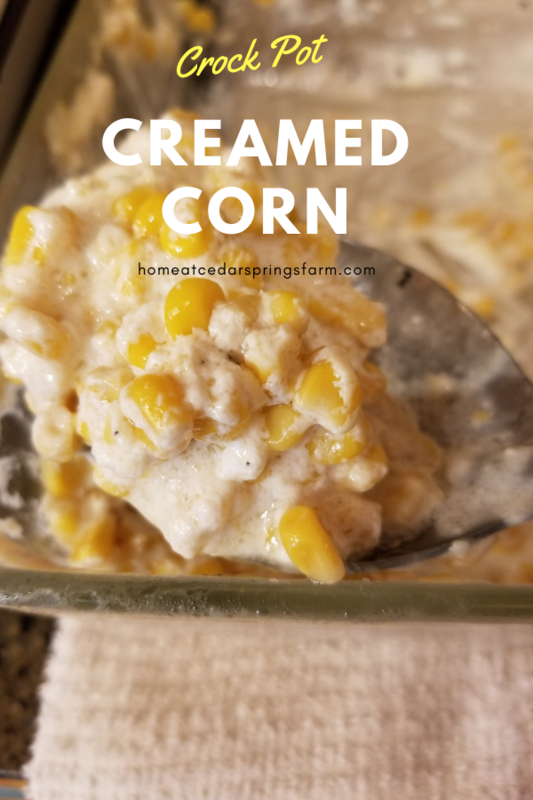 Crock Pot Creamed Corn is a simple side dish for any night of the week or if you need to feed a crowd. This makes the creamiest creamed corn you have ever eaten. The cream cheese, butter, heavy cream, and sugar come together to make the most delicious cream for this corn. Place all ingredients in the crock pot with cream cheese on top. Turn crock pot to high for 4 hours or low for 6. Stir well before serving. Add more salt and pepper if desired. Sounds like a great recipe! I can’t wait to try it. What size can corn? I’m loving all these recipes. Getting ready for all the feast, with your help. This corn is good and also easy to make. Glad you enjoyed it!